A student who attends part-time at The Academy for Classical Christian Studies packs her backpack at the end of a recent school day. For the first time ever, students can attend an Oklahoma private school part-time yet have most or all of the tuition paid by scholarships funded through a state tax-credit program. The scholarship program, promoted by school-choice advocates, is typically used to subsidize tuition costs for full-time students at private schools. But The Academy for Classical Christian Studies, with three schools in the Oklahoma City area, has added a twist to the program: Its students can use the scholarships to attend school only two or three days a week, depending on their grade, while being home-schooled the other days. Under state law, these students are considered home-schoolers. But the part-time option raises questions about the intent of state law. Should a part-time student qualify for the same amount of tax-credit scholarship dollars as a full-time student? And could those students enroll in a publicly funded online charter school for their home-schooled days? The implications are potentially significant. 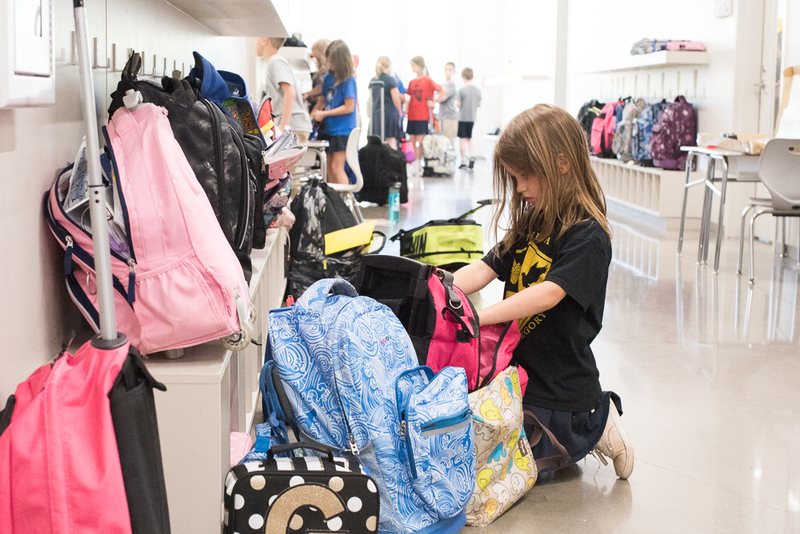 To increase enrollment and revenue, more private schools might begin offering part-time attendance while expanding their market base to thousands of Oklahoma families who choose or wish to use home-schooling. The state law that authorizes the scholarship program – the Oklahoma Equal Opportunity Scholarship Act – doesn’t say students have to attend school full-time. It just says the school they attend has to be accredited. The part-time option also could increase demands to expand the scholarship program. Statewide, funding for the tax-credit program and a companion program for public schools is capped at $5 million. The Oklahoma Tax Commission says qualifying donations exceeded the cap for 2017 for the first time. School choice advocates say the state should raise or eliminate the cap and broaden eligibility for the program. They argue it saves the state money because public schools will have fewer students to educate. Advocates for traditional public schools say the tax credits take money away from an already underfunded public-education system and mostly benefit affluent families who would have enrolled their children in private schools anyway. Oklahoma is one of 18 states with an tax-credit scholarship program, according to EdChoice, and most participating schools are religious. Students line the halls of The Academy of Classical Christian Studies. The school has campuses in north, midtown and south Oklahoma City. Some Oklahoma private schools have reported a slow start to their efforts to attract donations to fund tax-credit scholarships – a program authorized by the Legislature in 2011. The Academy for Classical Christian Studies had little trouble. It received over $800,000 in donations in 2016 and 2017 combined, the school’s first two years participating. The tax-credit program works this way: An individual or company donates to a nonprofit scholarship granting organization and receives, within limits, a reduction on state income taxes owed. Taxpayers can take 50 percent of their donation as a tax credit in one year or 75 percent with a two-year commitment. They also can deduct the amount as a charitable gift if itemizing on their federal tax return. The scholarship organizations direct the funds to private schools, and the schools use the money to offset tuition for selected students. There are now 11 such organizations, according to the Oklahoma Tax Commission. The largest, the Opportunity Scholarship Fund, distributes funds to 61 schools, but some schools are creating their own scholarship fund, which is what the Academy did. Curt Stafford, director of the nonprofit that manages the Academy’s scholarship program, said one business donated the maximum of $100,000 for two years, which helped boost the total. The school’s total donations will likely be smaller this year without that donor, which he wouldn’t name and is not public information. The Academy has 540 students this year, two-thirds of whom are in its “blended model,” meaning elementary students attend two days a week and middle-school students three days. They are home-schooled other days. High school students must attend five days a week. In the blended model, “parents are able to remain highly involved in their children’s education without relinquishing all direct instructional interaction to an educational institution,” the school’s website says. Tuition under the blended model is about half of the traditional five-day model. Parents of a kindergartener, for instance, would pay $4,480 a year instead of $8,960. Statewide, students can receive up to $6,900 in tax-credit scholarships, but actual amounts vary. Families receiving a scholarship have to meet income parameters, which is currently a maximum of $136,530 for a family of four. The Academy uses an outside firm to analyze family income and determine financial need. Blended students are eligible for scholarships, but because their tuition is reduced, so is their need, said Rebecca Wedel, admissions director for the school. Last year, 127 students received tax-credit funds, and 57 percent of those were enrolled in the blended program. Wedel said the program has been beneficial in helping families, especially low-income ones, afford the school’s tuition. Students practice sitting quietly and waiting to be dismissed from class at The Academy of Classical Christian Studies. 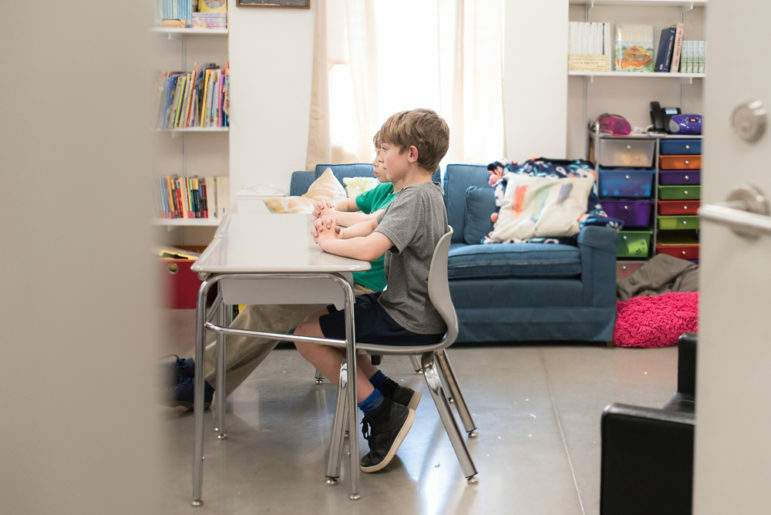 An estimated 25,000 Oklahoma children, or about 3.5 to 4 percent of the school-aged population, are home-schooled, according to survey-based estimates by the Home School Legal Defense Association. A 2017 report by the National Center for Education Statistics estimated 1.8 million U.S. children are home-schooled. Oklahoma’s tax-credit law doesn’t provide scholarships for home school. Robert Sellers, executive director of the Opportunity Scholarship Fund, said he doesn’t think the program should include those who only home-school because it would be difficult to quantify the costs. Sellers said it’s possible blended model students could enroll in a public online charter school for their home-school days, potentially attending public and private schools simultaneously. It would be difficult for either school to determine if dual enrollment was occurring. “It’s an honor system,” Sellers said. Oklahoma public schools, including virtual charter schools, don’t offer part-time schooling and receive the full per-pupil funding for each student. With home-schooling, parents have complete control over curriculum, pace and scheduling; many are motivated to home-school for religious reasons. 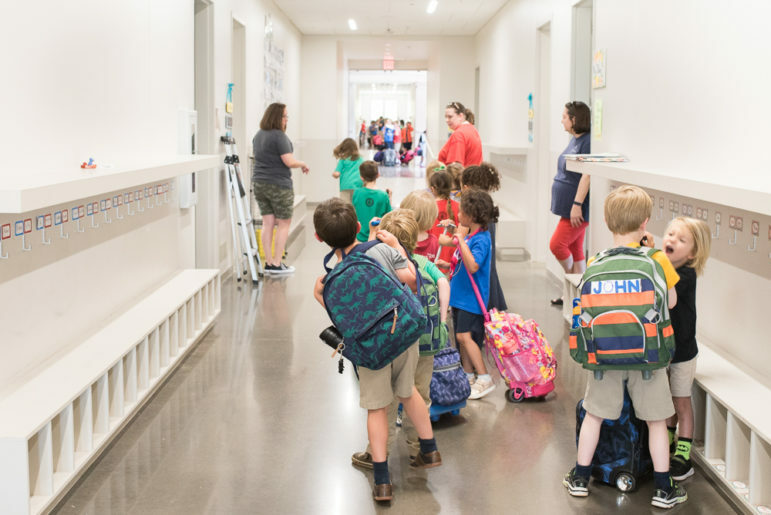 Casey Shutt, assistant headmaster at the Academy, said parents who are drawn to the blended model typically like the accountability, structure and socialization it adds to a typical home-schooling experience. The Academy offers a classical education, which includes teaching students through the Bible, history, philosophy and theology. Students learn cursive and study Latin, Shutt said. They also pray daily and have weekly chapel visits. Parent Catherine Brown said she wanted a classical Christian education for her children and at the time, the only school near her home offering that curriculum was a blended model. To make it work, she would co-op with another parent or use a part-time nanny to help her children with school work on the home-school days. “If Bible class and theology class and comparative religion class … are important to you, that’s a way to get all of those things but not necessarily have to pay the same equivalent tuition as you would to go to five-day private school,” she said. Brown did not receive a tax credit scholarship. The fund also wants lawmakers to apply the tax credits to other forms of taxes, such as alcohol, tobacco, insurance premiums and sales taxes. Its report says the program has an estimated potential of more than $80 million and could provide scholarships to 30,000 students.